KALI LIVE! invites you to engage with notable East African women writers, artists, and thought leaders LIVE! This series presents a wide variety of topics and genres, through discussions and presentations, by leading experts in their fields. 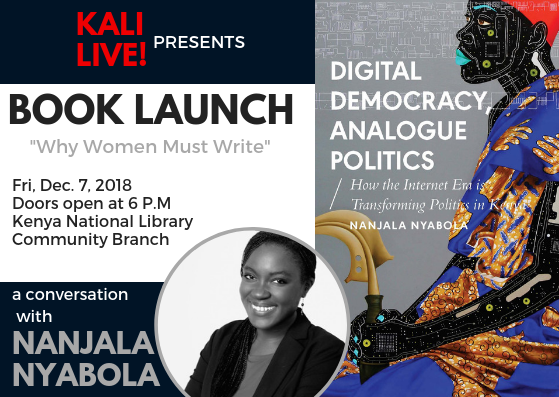 BOOK LAUNCH: Nanjala Nyabola - "Digital Democracy, Analogue Politics"
Doors open @ 6:00 p.m.
KALI LIVE! presents the launch of Kenyan writer and political analyst Nanjala Nyabola’s first book "Digital Democracy, Analogue Politics." Her new book is a fascinating account of how the digital age has impacted Kenyan politics, and the consequences for understanding the role of social media in democracies across Africa. Nyabola will be in conversation with writer, journalist and 2018 Harvard University Nieman Fellow Christine Mungai. They will discuss the new book as well as the importance and urgency of women putting pen to paper. The event will be followed by book signing. Prestige Bookstore will be selling the book at the venue for KES 2,690. Cash, mpesa or card payments available. Photography by Zachary Rosen. Kali logo design by Sherida Kuffour/ Debra Cartwright. Website Design by Kali Media. ©2018 KALI MEDIA, ALL RIGHTS RESERVED.